Standalone Custom Tours are for business types which aren’t suitable for the Google Street View program (e.g. hospitals, legal establishments, banks, private residences, Airbnb). If you are unsure, please contact us to find out if your business qualifies. 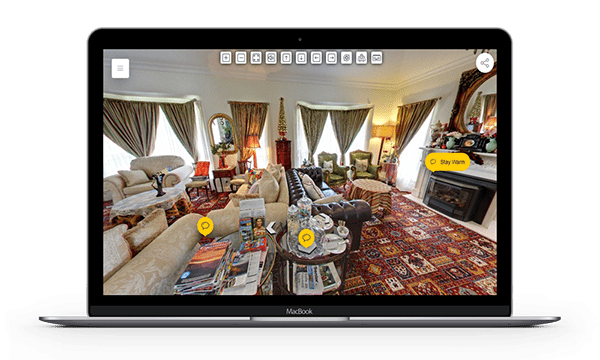 Custom Tours can feature navigational menus, audio hot spots, website links, informational hot spots, social media links and interactive floor plans, aerospheres and more. These enhancements compel visitors to spend more time on your site and provide your business the ability to market your products and services in a new way. Standalone Custom Tours are the only tour type which allow us to make changes to the photographs captured on site via Adobe Photoshop (sky replacement, remove blemishes, add layers etc.) prior to publishing. Navigational menu for quick and easy movement throughout the premises. This menu is necessary for larger venues and enables direct access to key areas of the virtual tour. Incorporate your logo into the virtual tour, allowing users to navigate directly to your website. Allow users to get a better sense of the overall layout of the premises and it's surroundings. Integrated floor plans provide users with a straightforward 'click-to-'teleport' experience. Attract attention to specific items and areas and provide further information about particular products, services, sales or promotions. Make brochures, posters, flyers etc. come to life with a single click. Allow potential customers to navigate directly your website or online store to purchase particular products and services (e.g. booking accommodation, tickets or seats). Standalone Custom Tours allow us to make necessary changes to the tour and it's appearance via Photoshop (sky replacement, remove blemishes, add layers etc.) prior to publishing. Incorporate music, voice overs or sound effects into an individual scene or throughout the tour to further immerse the user. Feel free to contact us if you require assistance with any audio production. 360° aerial tour positions are perfect for showcasing larger venues and environments. Please contact us to discuss your project or find out more about our CASA certified UAV services. We can generate custom embed codes for your website (adjust height and width) or QR codes for you to print or display anywhere else you'd like people to launch the tour from. View in Full-Screen for an immersive experience. Want to compare a Standalone Custom Tour to an Enhanced Tour or Google Street View tour?